The co-owner of Hybrid-racing.com, Will Davidson, requested a search-engine-optimization site review. I’m happy to oblige. The first thing that struck me was that WordPress was the main “wrapper” for the site, powering the home page, tech articles, gallery, blog, and product information pages (in the “HR Products” tab). Magento is the shopping cart, but it’s relegated to the “Hybrid Store” section of the site. It’s somewhat unusual for an ecommerce site to be primarily on the WordPress platform. Typically I see just a blog hanging off of the ecommerce site that’s running on WordPress and that’s it. Some of the perks of WordPress include RSS feed support and a plethora of useful plug-ins for SEO, like SEO Title Tag (which offers a mass editing capability for the site’s title tags) and Google XML Sitemaps. Speaking of sitemaps, there doesn’t appear to be an XML sitemap on the site. The SEO Site Tools extension for Google Chrome (be sure to check out all the tool’s tabs, including Page Elements, Social Media, Page Terms/Tools, Server/Domain Info, and Suggestions) reports that there is no sitemaps XML file or robots.txt. I would have liked to see a robots.txt file that included a reference to a sitemaps.xml file, so the sitemap could be “auto-discovered” by the engines. The External Page Data tab in the SEO Site Tools extension tells us the home page is a PageRank 3, its mozRank (from Linkscape) is 4.71, domain rank is 3.92, and Yahoo! Site Explorer inlinks are an impressive 18,282. This last number is certainly overstated. Consider, for example, that the LinkedIn page for Will Davidson is showing up, even though it’s a nofollowed link, and The Unofficial Apple Weblog home page is showing up even though the link is no longer present on the page. A better inlink count comes from Open Site Explorer, which reports a mere 65 unique domains linking to the site. I found it slightly alarming that the meta description and meta keywords are the same across all the WordPress generated pages, which is curious, considering the All-in-One SEO Pack is installed (it was advertised in the HTML source). The meta description is worse on the Hybrid Store page: “Default Description.” That same ineffective meta description is used across all the store’s category pages. The meta keywords are the same across the Hybrid Store page and all category pages, too. It’s better to have no meta description or keywords than to have them duplicated across a large swath of pages. Although the product pages within the Store have unique meta descriptions, they are incredibly long. Look at the meta description on http://www.hybrid-racing.com/store/hr-05-06-speed-conveter-box.html, for example. The URLs for the WordPress pages are not search engine optimal. The URLs are dynamic and devoid of keywords (e.g. http://www.hybrid-racing.com/?cat=6&p=1097). With WordPress, it’s incredibly simple to switch on static-looking keyword URLs by using the Permalinks tab in the Settings section. From there select either “Day and name” or “Month and name.” Or better yet, define a “Custom Structure” of “/%postname%/” which leaves the date out of the URL. I noticed in the HTML source of the WordPress pages there are canonical tags that leave the “cat” parameter out of the permalink URLs. That’s cool, but it’s not working all the time. 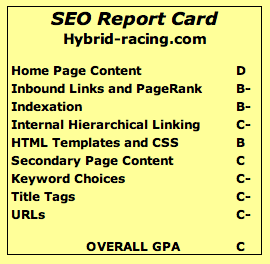 For instance, the aforementioned URL (http://www.hybrid-racing.com/?cat=6&p=1097) is indexed in Google even though the canonical tag is instructing Google to aggregate the PageRank of this URL to the http://www.hybrid-racing.com/?p=1097 URL. That’s a disobedient Googlebot. Incidentally, I noticed that the WordPress version (2.8.4) is mentioned in the HTML source. That’s a security weakness that can be exploited by hackers. If they know your version of WordPress and it’s an older one that has security vulnerabilities, they can exploit that. The URLs in the Hybrid Store are in much better shape, with static URLs containing keywords separated by hyphens. Too bad the category names are too cryptic / generic to benefit. For example, The Exhaust category page at http://www.hybrid-racing.com/store/exhaust is targeting the search term “exhaust” rather than “exhaust pipes.” It’s not helping matters that the word “pipes” isn’t in the page copy (there’s no intro page copy, only navigational boilerplate and product names/thumbnails) or in the title tag (it’s a one-word title tag). The title tags are similarly poor across the other categories (e.g. “Cooling,” “Accessories,” “Engine,” “Swap Parts”). Many pages are suffering from a lack of page copy. For example, both http://www.hybrid-racing.com/?p=1111 and http://www.hybrid-racing.com/?p=1137 include embedded YouTube videos, but no page copy to go with them. This is a missed opportunity. What are these pages “singing” to the search engines for? Are wondering if embedding YouTube videos can help with your SEO? In short, the answer is no. But that said, if you have videos, by all means upload them to YouTube and optimize the videos’ titles and descriptions to use good keywords, and add some relevant tags. You can even include a URL in the video description (near the beginning, so that it’s included on the page) and YouTube will automatically make that URL clickable — and nofollowed (no link juice, sorry). It’s not that often I see CSS image replacement on a site, so I was surprised to see it on Hybrid-racing.com. It was well implemented on the navigation bar. But the image replacement of the logo was a different matter: What was the point of creating an H1 tag of “Hybrid Racing” and replacing it with the logo graphic? It isn’t accomplishing anything useful from an SEO standpoint. In fact, it creates an H1 tag that is the same across the site instead of being uniquely page-specific. The H2 tags (“My Cart,” “Shop For:,” “Brands,” etc.) are all navigation-related and the same across all the store pages. I am a fan of both WordPress and Magento, so kudos to Hybrid Racing for choosing them. But it’s important to remember neither are search engine optimal out-of-the-box. They are search engine friendly. There’s a difference. The former doesn’t repel the search engines, but the latter requires “elbow grease” in the form of keyword research and skilled copywriting, not to mention numerous technical and architectural tweaks. Request an “SEO Report Card” by emailing seo.report@practicalecommerce.com.